Our handy Hebrew alphabet chart will help you learn Hebrew writing. 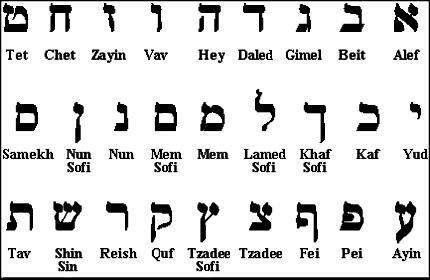 The Hebrew alphabet contains 22 letters and is read from right to left. To make learning the Hebrew language even more interesting, you'll soon discover that there are in fact several different alphabets in use, although you probably won't need to learn more than two of them. The most common types of Hebrew writing are Ktav Ashuri, which is still widely used, and an ancient Hebrew alphabet called Ktav Ivri. Archaeologists have found many artifacts with Hebrew writing in Ktav Ivri. The Talmud debates in which of the two scripts the Torah was given, and the general consensus is that it was given Ktav Ashuri, which is the script that Jewish scribes use to this day when writing a Torah scroll, mezuzah or tefillin (phylacteries). Actually, scribes must use a specific style of Ktav Ashuri called Sta”M. Much Hebrew language material today uses block print – Ktav Ashuri. Textbooks, newspapers, food packaging in Israeli supermarkets all mostly rely on Ktav Ashuri or derivatives of it. If you were jotting down a shopping list or taking notes in class, however, you’d be more likely to use a cursive script – just as you would in English. It's a lot faster to write, although, like most handwriting, it's also harder to decipher. Modern Hebrew script is only about 200 years old. There is another alphabet known as Rashi script, named in honor of the greatest of all Jewish commentators, Rabbi Solomon Yitzhaki, who lived in 11th century Troyes. This script is often used for Biblical and Talmudic commentaries. Block Hebrew print - Ktav Ashuri - looks like this. Note that the chart goes from right to left. STa”M is the script used for Jewish religious artifacts. The word is an acronym of sefer Torah (Torah scroll), tefillin (phylacteries) and mezuzos, the three main Jewish articles that contain script on parchment. It's pretty close to what you'll find in Torah scrolls, tefillin and mezzuza scrolls. Religious scribes train for many years to learn their craft and the minute details of this script.